With their sticky toe-pads treefrogs can walk up glass windows. They are often found on phone booths at night hunting for insects attracted to the lights. There are four species of treefrogs (Family: Hylidae) in Manitoba, all of which are considered to be quite common and widespread. Determining the northern limits of all these species, and the relative distributions of the two Gray Treefrog species are of particular interest to this project. Current conservation rankings by the Manitoba Conservation Data Centre are included here. For explanations of the ranking terminology: Click Here. Special Note: These two closely related species of treefrog cannot be distinguished visually. 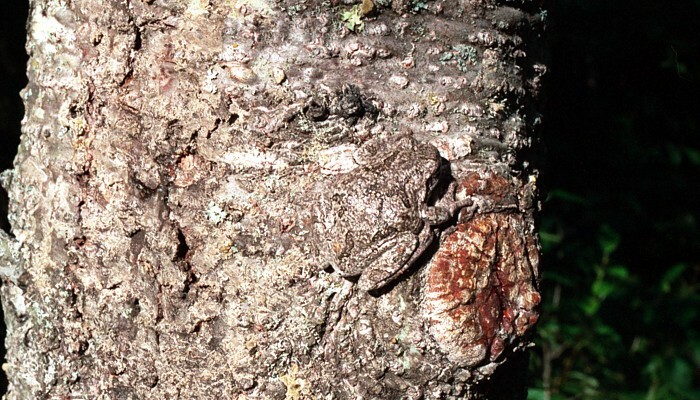 Through a complex evolutionary process, only recently investigated, Cope's Gray Treefrog gave rise to the Gray Treefrog. Cope's Gray Treefrog has the regular diploid number of chromosomes (2N); it has it's chromosomes in pairs. 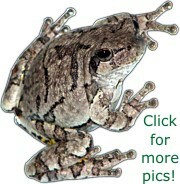 The Gray Treefrog is tetraploid (4N); it has it's chromosomes in sets of 4! Fortunately their mating calls are fairly distinct. However, mating call appears to be the only way in which the two species differ, so information about them is presented together. 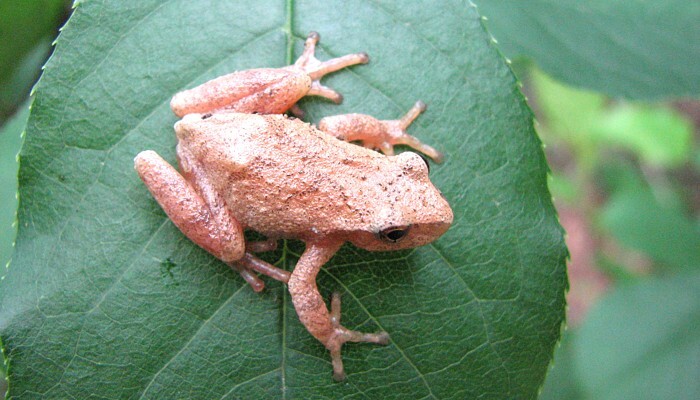 For more on the evolution of tetraploidy in Gray Treefrogs read this article: Polyploid Hybrids: Multiple Origins of a Treefrog Species. 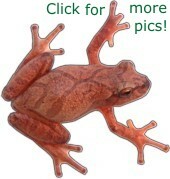 Description: A medium sized frog, to 6 cm body length. Skin is rough, but not warty. Highly variable in colour, individuals may be light gray to dark charcoal gray, or light to bright green with varying patches of darker colours. Individuals can change colour within a few hours from one extreme to another. The belly is white. There are bright yellow patches on the inside of the hind legs and there are widened, sticky pads on the ends of all toes. Habitat: Forested areas near wetlands or along water courses. Status and Range in Manitoba: Both Treefrogs are common in southern Manitoba. 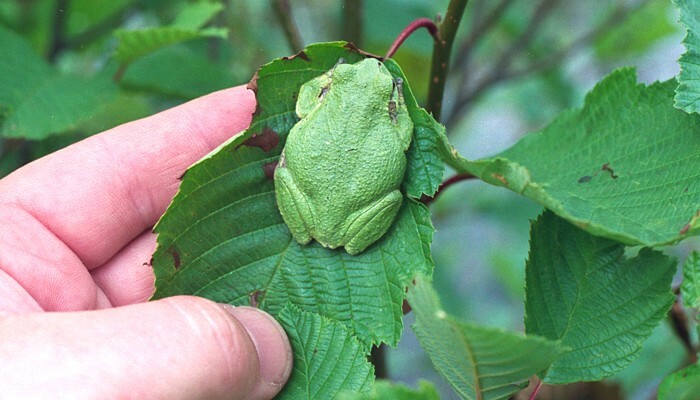 Cope's Gray Treefrog (S4) is thought to occur across the southern part of the province, below Lakes Winnipeg and Manitoba, with the exception of the extreme southwest and southeast corners of the province. While the Gray Treefrog (S4/S5) is found in a band stretching from the southeast corner of the province north to the middle of Lake Winnipeg and west to near the Saskatchewan border. Current Range Map for the Gray Treefrogs. Life Cycle: Treefrogs prefer to breed in small temporary ponds. Males call from mid-May to mid-June in southern Manitoba. 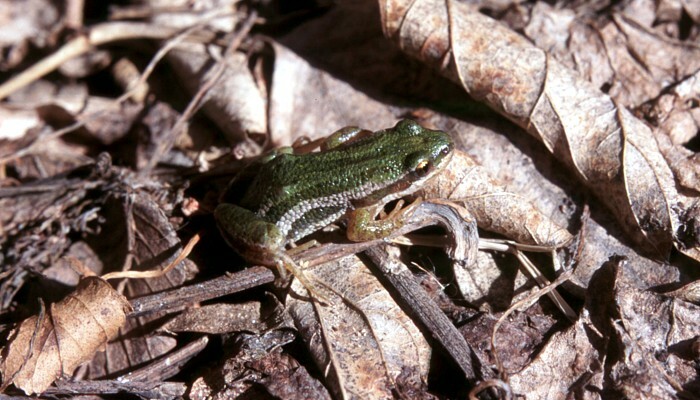 Treefrogs may call some distance from the breeding ponds. Once a male has attracted a female the two will move the pond to breed. 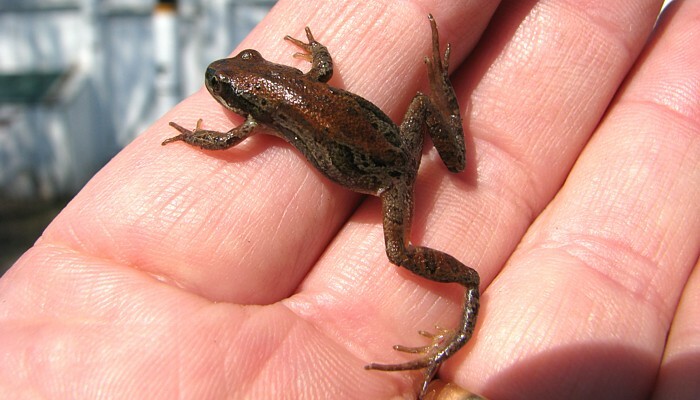 Eggs laid in late May may result in transformed froglets by mid July. 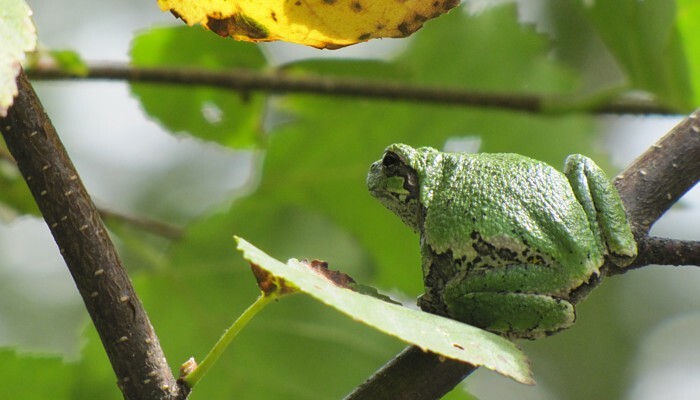 Hear the Cope's Gray Treefrog mating call: Your browser does not support the audio element. Hear the Gray Treefrog mating call: Your browser does not support the audio element. Tips on finding this species: Listen for males calling from mid-May to mid-June. Evening is the best time to hear them, but they will call during the day, too. As their name implies, treefrogs are largely arboreal, so look for them up off the ground. They are often found near bright lights at night where they hunt insects attracted to the lights. Look for them at night on lighted phone booths or other lighted structures in forested areas. Description: A small frog, to 3.5 cm body length. Tan to light, rusty brown in colour with a distinct darker cross-shaped marking (X) on the back. The colour of individuals can lighten or darken considerably in a short period, but there is not a lot of variation within the species. All individuals will carry the cross on the back. Habitat: Forested areas near wetlands. Status and Range in Manitoba: Spring Peepers are common in southeastern Manitoba (S5). They are found east of Lake Winnipeg, from the Minnesota border to at least the north end of Lake Winnipeg. Current Range Map for the Spring Peeper. Life Cycle: Males call from early May to early June. Males congregate at breeding ponds and call from the cover of vegetation at the water's edge. 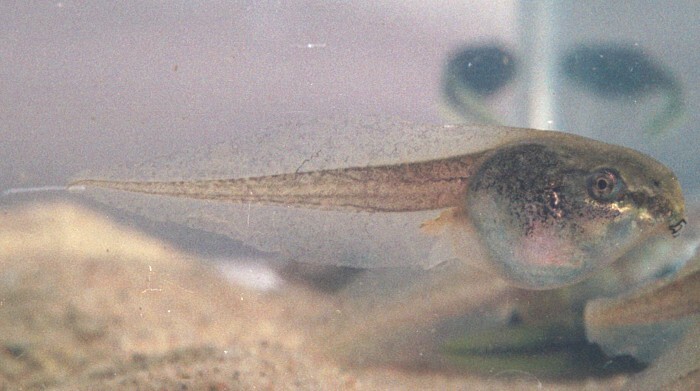 Eggs laid in late May may result in transformed froglets by mid July. 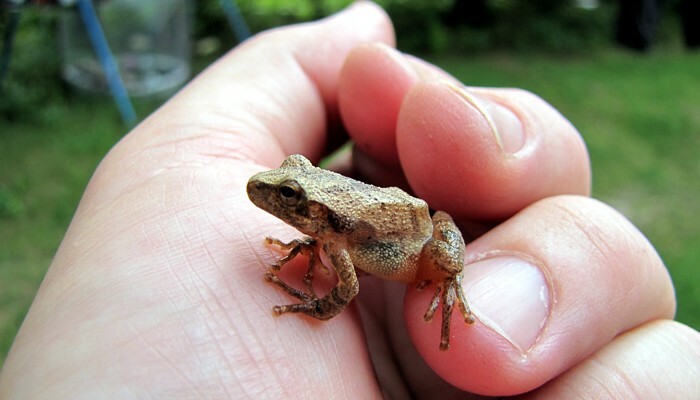 Hear the Spring Peeper mating call: Your browser does not support the audio element. Tips on finding this species: Listen for males calling from May to early June. Evening is the best time to hear them, but they will call during the day as well. 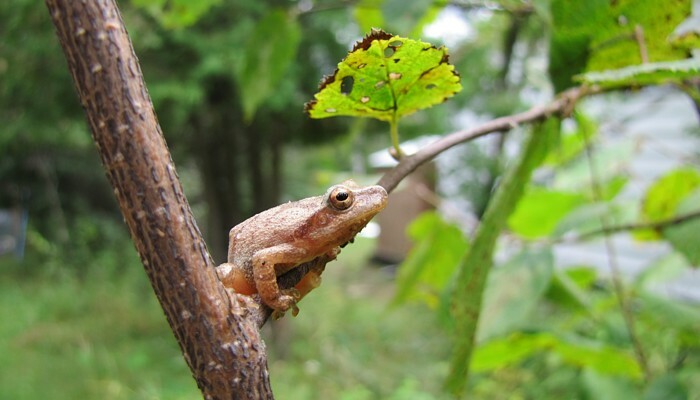 Peepers are tiny and secretive, the odds of ever seeing one, other than near a pond during the breeding season, are very low, but keep your eyes peeled on low shrubs while walking along trails in forested areas. 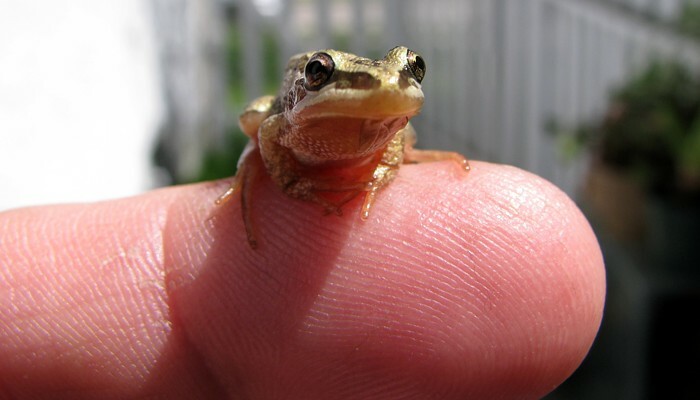 Description: A small frog, to 3.5 cm body length. Variable in colour and patterning, from light brown to rusty brown, gray to bright green, with dark patches and stripes in any combination of gray, green or brown. Underside is light gray or cream coloured. The colour of individuals can lighten or darken considerably in a short period. 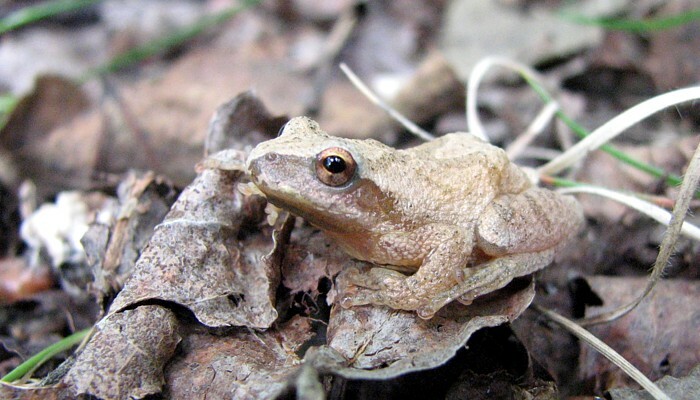 The absence of an 'X' on the back distinguishes Chorus Frogs from Spring Peepers. Habitat: Moist forests and grasslands, or edge of wetlands. Can be found in any moist habitat. 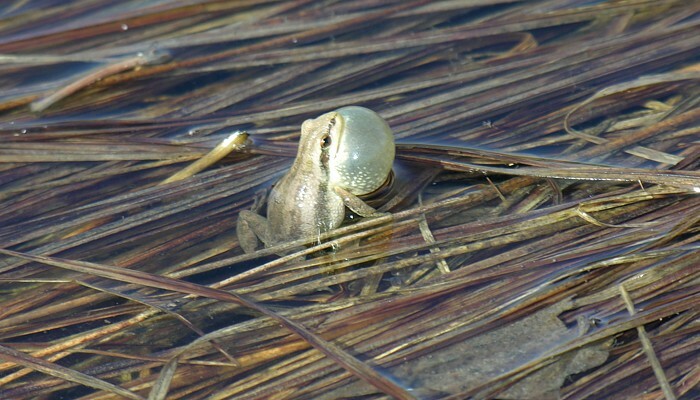 Status and Range in Manitoba: Boreal Chorus Frogs are widespread and abundant in Manitoba (S5). They are found throughout the entire province except in the far north. Current Range Map for the Boreal Chorus Frog. Life Cycle: Males call from mid-April to early June in southern Manitoba. Chorus frogs congregate at small ponds, calling from the cover of vegetation at the water's edge. 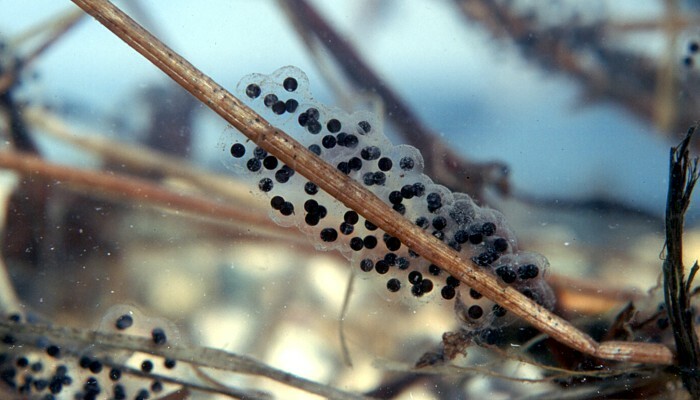 Eggs are attached to submerged vegetation. 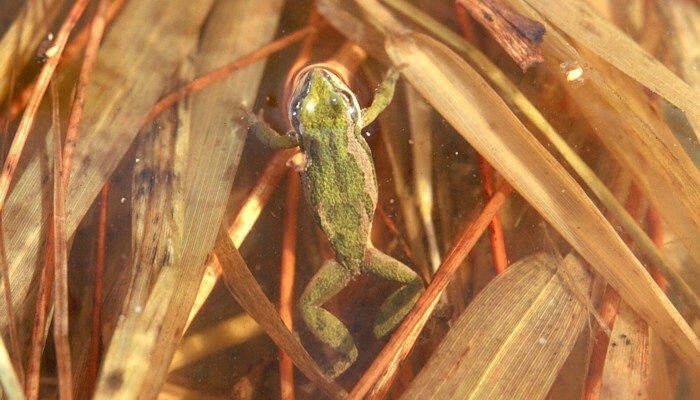 In southern Manitoba, eggs laid in April will result in transformed froglets by late June or early July. Hear the Boreal Chorus Frog mating call: Your browser does not support the audio element. Tips on finding this species: Listen for males calling from mid-April to early June, but keep your ears peeled later in the season, too. Heavy rains can trigger calling in males until mid-summer. Whether they actively breed after the initial spring breeding season isn't known. Evening is the best time to hear them, but they will call during the day, too. Despite being a treefrog this is largely a ground dwelling species, though it can climb well. Being tiny and secretive they are rarely seen, but occasionally can be spotted in exposed settings.